Mrs. Carolyn Muir rents charming Maine Gull Cottage for her family and finds that it comes with a resident ghost. Captain Gregg takes a shine to the pretty widow and allows them to stay in his house. Thanks to Cousin Harriet's gossip, Carolyn's parents get the idea that the Captain is a real man that their daughter is seeing and come for a visit wanting to meet him. Each of those living at Gull Cottage has their own special Christmas dream thanks to the Captain. In Mrs. Muir's dream the Captain and her confess their love to each other and exchange a kiss. Q: Is Schooner Bay, Maine a real place? Pretty widow, her twinkling kids and brash housekeeper (and yapping dog, Scruffy) move into haunted Gull Cottage on Schooner's Bay. 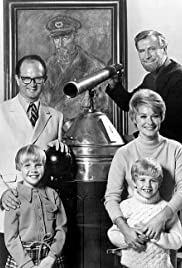 The ghost (a salty sea captain with a penchant for hard-shelled sentimentality) grudgingly befriends the glowing Mrs. Muir, and also appears to the kids from time to time and landowner Charles Nelson Reilly. Adapted from the book and 1947 movie with Rex Harrison, this TV series suffers from low-budget-itis (the characters rarely venture outdoors, except in the credits sequence, and when they do they're still stuck in the studio). The two children have very little personality between them--especially compared to, say, the "Family Affair" twins--however the low-keyed "sexual" chemistry between the leads (Hope Lange and Edward Mulhare) is certainly warm, carrying the show through some colorless episodes (such as an embarrassing one wherein pop star Nilsson drops in during a storm to play a little guitar! Egads!). The ghostly comings-and-goings of Captain Gregg are very "Bewitched"-like, and the show ultimately suffers from not utilizing its supernatural theme enough (i.e., too much playing 'catch' in the yard), but Lange and Mulhare make it worthwhile.